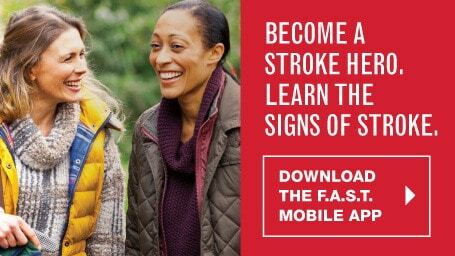 Home » Family Life » Spot a stroke F.A.S.T with these tips! Having spent 15 years working in a pharmacy, I have seen people with a lot of different kinds of medical issues. In today’s day and age, just about everyone suffers from one disease or another as they grow older. Some health problems are preventable. Eat healthy and exercise and you greatly reduce your chance of heart disease and high cholesterol. Sometimes we suffer from something that is genetic. And occasionally, people suffer from something that hits them completely out of the blue like a stroke. Did you know that stroke is the fifth leading cause of death and the leading preventable cause of disability in the US? 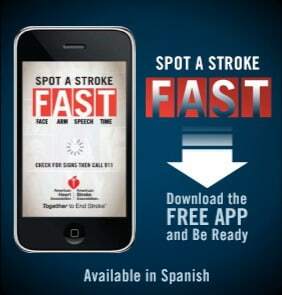 Each year, about 800,000 Americans suffer a new or recurrent stroke. Furthermore, someone in the world has a stroke every 2 seconds. 1 in 3 Americans cannot name at least one sign of stroke. 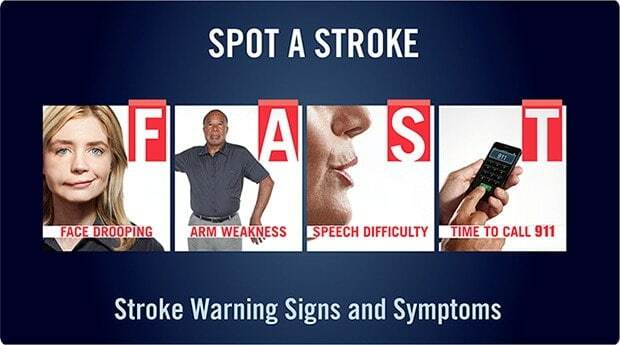 When you recognize a stroke and immediately call 9-1-1, the person has a greater chance of getting to an appropriate hospital quickly and being assessed for treatment options like a clot-busting drug or clot-busting device. Someone in the world has a stroke every 2 seconds. 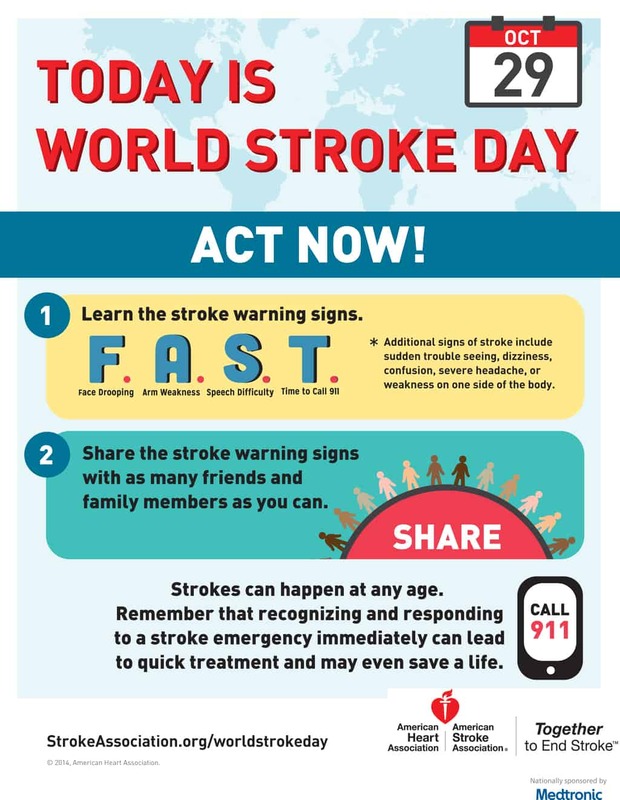 In the U.S. stroke is the No. 5 cause of death overall, killing nearly 130,000 people a year. Stroke is the No. 1 preventable cause of long-term disability. About 800,000 people have a stroke every year. F – Face Drooping – Does one side of the face droop or is it numb? Ask the person to smile. S – Speech Difficulty – Is speech slurred? Are they unable to speak, or are they hard to understand? Ask the person to repeat a simple sentence like: “The sky is blue.” Is the sentence repeated correctly? Share the F.A.S.T. Song – The ASA has created a simple song to help people remember the stroke warning signs. We have the F.A.S.T. song in several musical styles – pick your favorite and share! If you’re really brave, sing it, or record a lip sync version. It’s fun and for a good cause. Use the #singFAST hashtag. Join the @American Stroke Twitter Chat! It will be hosted by @iHeartRadio on 10/29 at 12pm CT. The hashtag is #StrokeChat. Hear other people’s F.A.S.T. Songs, share your own, and join us for a great discussion about stroke! There will be giveaways. This is great information! I know several people that have had a stroke.